The last three months have been particularly active ones for the Swift team. Operations continue at a dizzying pace. Every day we perform 50 to 100 observations, far more than any other astronomical satellite (see article by John Nousek). These include, of course, observations of new gamma-ray bursts (GRBs), follow-up examination of the fading light from previous GRBs, target-of-opportunity (TOO) pointings requested by the astronomical community of transient objects in the sky (like novae or active galaxy flares), and dozens of observations of other interesting sources. One of the more unusual TOOs performed last month was of Comet Tempel 1 during the blast from Deep Impact. The Swift data are quite striking as described in the article by Keith Mason in this issue. We had an exciting Swift team meeting at Goddard July 26-27 with about 100 attendees (see article by Padi Boyd). I was pleased that reporters Ron Cowen and Bob Zimmerman were able to attend; they are each writing magazine articles on the new Swift results. For two days we talked about all the discoveries coming from Swift and the papers being written on these findings. In our short 8 months in orbit, there are already 30 papers on Swift data submitted or already published in the professional journals, including six in the prestigious Nature and Science, and over 40 other papers in preparation. I would like to tell you about the most important discovery that Swift has made in the last months. We detected a GRB on September 4, 2005 that was much further away than any burst ever previously detected. This burst, known as GRB050904, was faint, and was only detected because of a special trigger on Swift that was specifically designed by our team members at Los Alamos National Laboratory to find these distant bursts. 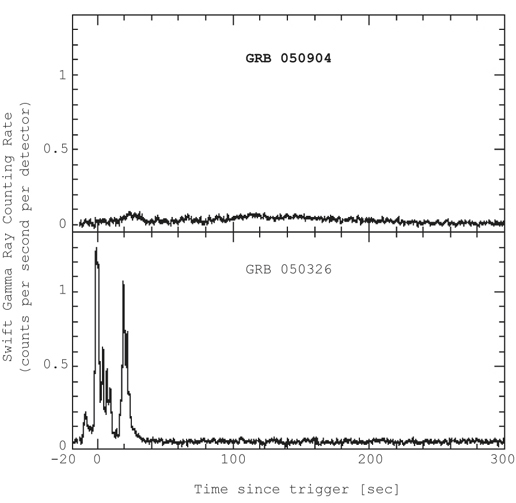 The figure on the left shows GRB050904 in comparison to a burst typically seen by Swift – it is weak, and is also “stretched out” – probably due to its great distance. We know that objects observed at great distance have their time stretched by the expansion of the Universe. Thus it is natural that this GRB coming to us from the distant universe has its profile expanded and smoothed. The expansion of the Universe also shifts light to lower energies – this is called “redshifting.” In this case, much of the gamma-ray emission was redshifted into the X-ray band, and Swift’s XRT saw a strong signal. And afterglow emission that is usually detected in the visible light band was shifted into the infrared – and discovered by Prof. Daniel Reichart and his undergraduate student Josh Haislip of the University of North Carolina, using the NSF/NOAO 4.1m Southern Observatory for Astrophysical Research (SOAR) telescope. The figure to the right is the discover y image of the afterglow of the burst. Many other observers tried to detect the afterglow of this burst, but very little emission was seen at visible wavelengths. Dr. Reichart’s observations yielded an approximate distance to the burst, and later infrared observations by a team led by Dr. Nobuyaki Kawai from the Tokyo Institute of Technology used the NAOJ 8.2-meter Subaru telescope to measure a precise distance to the explosion: 12.8 billion light-years. This is less than one billion light years after the Big Bang! I hope you are having fun learning about the neat new findings from Swift and enjoy this edition of the Newsletter. 5/11/05 NASA Scientists Catch Unique Gamma-Ray Burst. This HQ release announced the first localization and possible visible-light counterpart of a Swiftly-observed "short" burst, what some scientists have called the "Holy Grail" of GRBs. The press release is on the NASA Goddard Space Flight Center website, and more information is on the NASA website. 7/4/05 NASA Swift Satellite Offers a Different View of the Great Comet Collision. This press release from Penn State shows multi-wavelength views and movies of NASA's Deep Impact collision with Comet Tempel 1. 7/8/05 Scientists Measure How Deep "Deep Impact" Was, With X-rays. This press release from Penn State featured the detection of a delayed brightening in X-rays that may provide information on how much material was released during the collision of NASA's Deep Impact probe with Comet Tempel 1. 8/18/05 NASA's Swift Satellite Finds Newborn Black Holes. This HQ release announced the discovery by Swift of many bursts that show repeated flaring during the burst decay, indicating continuous "gorging by the newly formed black holes at the same time as they are also expelling matter away during the gamma-ray bursts. You can read more on NASA's website and at the NASA Goddard Space Flight Center website. 9/12/05 The most distant stellar explosion ever detected, GRB050904, smashed previous records, and indicates that massive stars were formed within a few hundred million years after the Big Bang. Read more about it at the NASA press website and see the animations and graphics that were presented during the telecon press briefing from NASA HQ. Comets are frozen balls of ice and rock—not exactly what you'd expect to be a Swift target. But on July 4th of this year, Comet Tempel 1 was dead center in Swift's detectors when NASA's Deep Impact probe collided with the snowball at 10 kilometers per second. Surprisingly, comets can be quite bright sources of X-rays. It's thought that this is a result of a charge exchange mechanism between cometary atoms and energetic particles in the solar wind—the positive ions in the solar wind strip electrons off the comet, and as the electrons lose energy they emit X-rays. But no one knew how Tempel 1 would behave after the collision. Fortunately Swift was on the right side of the Earth to view the moment of impact. But more than that, Swift's pointing agility allowed it to come back on subsequent Earth-orbits to view the aftermath of the collision and monitor its effect on the comet over a period of several days. This was critical: Swift's XRT initially only saw low-level emission from Comet Tempel 1 for about three days after the impact. But then the comet brightened by almost an order of magnitude, the result of a solar storm that was tracking out through the solar wind, enveloping the comet in high velocity energetic particles. Swift also provided important UV observations of the collision as well. While X-rays are seen from the outer parts of gaseous head of the comet, the UV data tracks the changes caused by the impact closer to the nucleus. Swift's Ultraviolet and Optical Telescope took time-resolved images in the ultraviolet portion of the spectrum, in a band that is sensitive to emission from dissociated cometary molecules, including water. The brightness of the comet started to rise immediately after the collision with the Deep Impact probe, as material thrown up by the impact filled out the comet's coma. One Swift orbit later and the coma was about 4 times as bright as it had been pre-collision! Its UV brightness then gradually faded over the course of the next day, although there was a noticeable re-brightening just short of two days after the impact, as the comet's rotation period of 40.8 hours brought the collision point back into sunlight. Swift's Comet Tempel 1 observations were meticulously planned. It was a one-off event and we didn't want to risk missing it because of unexpected problems. The impact itself was monitored in real-time, using data transmitted through the Tracking and Data Relay Satellite System. Since no one was quite sure of what would happen when the probe collided, we were ready to respond in real-time in case, for example, the comet became too bright for Swift's detectors. As it transpired, everything went incredibly smoothly, highlighting Swift's potential as a multipurpose astronomical observatory, supplementing the ‘day job' of understanding gamma-ray bursts. Spectacular though the man-made July 4 cosmic fireworks were, mankind still has a ways to go to match nature in all her glory. A gamma-ray burst emits a factor of 10,000,000,000,000,000,000,000,000,000,000,000 times more energy than Deep Impact's probe did when it slammed into Comet Tempel 1! Swift has continued its fine record of both scientific discovery and technical virtuosity. Swift team members have authored 12 papers which have been accepted in refereed publications, and 18 more have been submitted and are either awaiting review, or are being revised in response to referees' remarks. The dramatic X-ray flares in GRB050406 and 050502b have been accepted for publication in "Science," in a paper led by David Burrows. The Swift-discovered early X-ray light curves have been accepted in a paper for "Nature," in a paper led by Gianpiero Tagliaferri. The press release on the discovery of the first counterpart to a short GRB was covered in the August "Discover" magazine, and a paper to Nature has been submitted. The Swift team has many other papers accepted, submitted or in preparation to technical journals. Kim Page and Dave Burrows have collected statistics on the allocation of Swift observing time since the start of normal operations on April 5 to July 11. The table shows how we have divided our time. In the table, "TOOs" stands for "Targets of Opportunity"; objects to observe added in to the routine schedule. These are usually re-observations of older bursts, or a new source that might be of interest for Swift to observe. On the technical side, the observatory and the instruments continue to work well. During the Memorial Day weekend, Swift encountered two un-related Attitude Control System (ACS) problems. We have now diagnosed both, and believe they were low-probability occurrences. On May 28 the ACS/Star Tracker system produced a bad quaternion (the ACS orientation matrix that measures where Swift is looking on the sky). On May 30 it appears the Star Tracker suffered a particle hit which corrupted memory, forcing us to carry out a cold reboot of the tracker. Neither problem has recurred, and we believe that we can respond quickly to any reoccurrences, keeping Swift efficiently observing the sky. More than 20,000 target slews have been conducted by the observatory to date. Of these, more than 7,000 have been to observations of new or recent GRB afterglows. On average we conduct 69.4 slews per day. Swift has also participated in multi-spacecraft campaigns. Most recently Swift has provided UV and X-ray coverage of the cataclysmic variable AE Aqr. Other observatories participating include the Chandra and GALEX space-borne observatories, and the MAGIC and HESS ground-based ones. Swift's agility and ease of scheduling have allowed it to take part with little overhead and short notice. We have been enjoying the excitement of the flow of discoveries and hope for many more to come! An exciting Swift Science Team Meeting was held at Goddard Space Flight Center on July 26-27, 2005 . The gathering was an opportunity for the people who worked long and hard to design, build, test and launch Swift to finally share in the excitement of what this satellite can really do! In the weeks leading up to the meeting, the Swift team had an eye-opening lesson in what “random” truly means. From June 8 to July 1, the BAT detected no new GRBs. No satellite at all detected any GRBs from July 1 through July 12. Then, from July 12 to July 20, the BAT found seven new bursts! In other words, there were eight bursts in six weeks (which is not too far from the average rate of 100 per year) but almost all of them occurred within the same week! In his talk on BAT status and performance, Scott Barthelmy reminded us that this is completely consistent with what we expect for bursts from Poisson statistics. There was a lot of excitement surrounding Swift's gamma-ray burst observations. XRT results included the dramatic X-ray flares in GRB050406 and 050502b, described by Abe Falcone, and the early X-ray light curves discussed by Gianpiero Tagliaferri. The discovery of the first counterpart to a short burst, GRB 050509b, long considered a holy grail in the field, was presented by Paul O'Brien (and there has been at least one more since then). The UVOT instrument has also contributed to the study of GRBs. Alex Blustin showed UV and optical light curves of the bright afterglow of GRB 050525a, while Pete Roming discussed the implications of the fraction of “dark GRBs” (no detectable optical afterglow) observed by UVOT. Swift has also been busy observing events in the universe that are not associated with GRBs. Several science talks described Swift observations of the Deep Impact collision with Comet Tempel 1, including a beautiful UV light curve for the comet, and an impressive X-ray flare. More details can be found at http://www.science.psu.edu/alert/Swift-Deep-Impact.htm and in the accompanying article by Keith Mason. Swift has also been following up recently discovered supernovae, and results from the optical and UV rise of SN2005cs and 2005cf were presented by Stephen Holland. Martin Still talked about the importance of having contemporaneous X-ray, UV and optical data on the Swift-discovered transient Swift J1753.5-0127. This binary is considered to be a strong black hole candidate, and Swift data throughout this outburst can be used to test models that describe black hole radiation. Rounding out the non-GRB science presentations, Jack Tueller and Craig Markwardt detailed their early results on active galaxies found in the BAT sky monitoring and survey project. By meeting's end, the entire Swift science team knew they had a lot to be proud of in the first nine months of operations, and a lot to look forward to: Swift promises to continue offering its unique view of gamma ray bursts and other astrophysical objects! Swift has partnered with the American Association of Variable Star Observers in supporting properly equipped amateur astronomers to chase GRBs (see Issue 1 for more information on this partnership). This is part of the High Energy Network of amateurs who observe objects such as AGN, pulsars, and other variable sources. We're pleased to note that two recent GRBs have been seen by amateur astronomers. GRB050730 was seen by Cristovao Jacques and Eduardo Pimentel at the CEAMIG-REA Observatory in Brazil . They were on the burst in less than four hours after the Swift trigger, and were able to get a clean image of it. They found an unfiltered magnitude of 18.4 using a 30 centimeter Schmidt-Cassegrain telescope equipped with an ST7MXE CCD camera. Douglas Durig at the Cordell-Lorenz Observatory in Tennessee used his 30 centimeter Schmidt-Cassegrain with an SBIG ST1001E CCD to observe GRB050502A, an INTEGRAL GRB, about two hours after the announcement was sent out. He was able to get a series of images and track the fading of the afterglow for almost an hour, watching it fade from a V magnitude of 19.8 to 21.3. GRB050502A was at a redshift of z=3.793 (about 12 billion light years away), making this one of the most distant objects ever seen by an amateur astronomer! E/PO team members are observing with GORT nearly every night, and we hope that we'll be able to catch a GRB ourselves at some point. It's only a matter of time… and Poisson statistics. 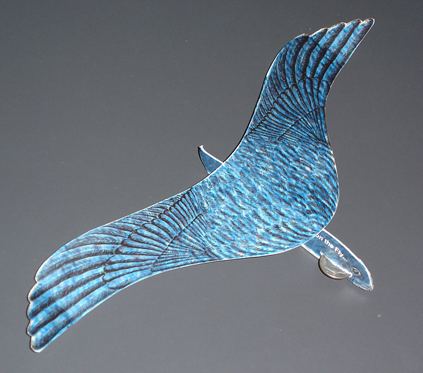 Aurore Simonnet, our resident science illustrator who has made all our beautiful artwork, created the “Swift Glider”: an easy-to-assemble paper glider shaped like a swift bird. Requiring just scissors, glue, and a few minutes of your time, this glider is fun to make and fly. We've printed 2500 of these to hand out at meetings and teacher workshops. We're printing 2500 more Swift paper model booklets. This is one of our most popular items! It's based on a design from Swift's Italian partners, modified to be more appropriate in the United States . 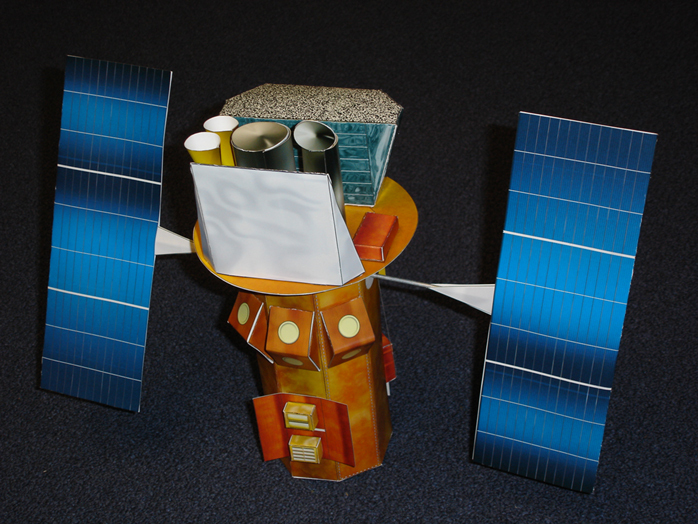 The model can be assembled in a day or so, and is a fairly accurate scale model of the spacecraft. Our first printing run was limited, so we originally gave these out to Swift team members, museums on the SpacePlace museum list, and NASA officials, etc. This second batch will mostly be given to teachers who attend our Swift workshops and other events. GORT, our remotely-operated telescope which is part of the Swift-sponsored Global Telescope Network, was used to observe the Deep Impact collision with comet Temple 1. SSU group members Tim Graves, Kevin McLin, Logan Hill, and Phil Plait took images before and after the impact. The comet was seen to brighten by a factor of 2.5 immediately after the impact. There was also a slight brightening before impact as well, which was seen by at least two other observatories. This may have been due to gases venting from the comet. McLin has also been using GORT to observe supernova SN2005cs in M51. Images of the galaxy and supernova are available at the GORT gallery, and comet images (including an animation made from 53 separate exposures) are at the GORT Deep Impact page.